The Cottages at Hickory Crossing are designed to house the 50 homeless people deemed the costliest to Dallas County. Some of Dallas’ neediest homeless people will soon have a place of their own: a tiny house. The Cottages at Hickory Crossing opened recently just south of Deep Ellum -- and residents are moving in over the next few weeks. Many say these small cottages are a step in the right direction in the city’s ongoing struggle with homelessness. The 50 cottages are clustered together like a small village or a summer camp, even. Gray and industrial on the outside – clean and cozy on the inside. They’re designed to house the 50 homeless people deemed the costliest to Dallas County’s hospitals, emergency services and jails. Officials have estimated these individuals each cost taxpayers about $40,000 a year. The cottages would cost significantly less per person – about $15,000. 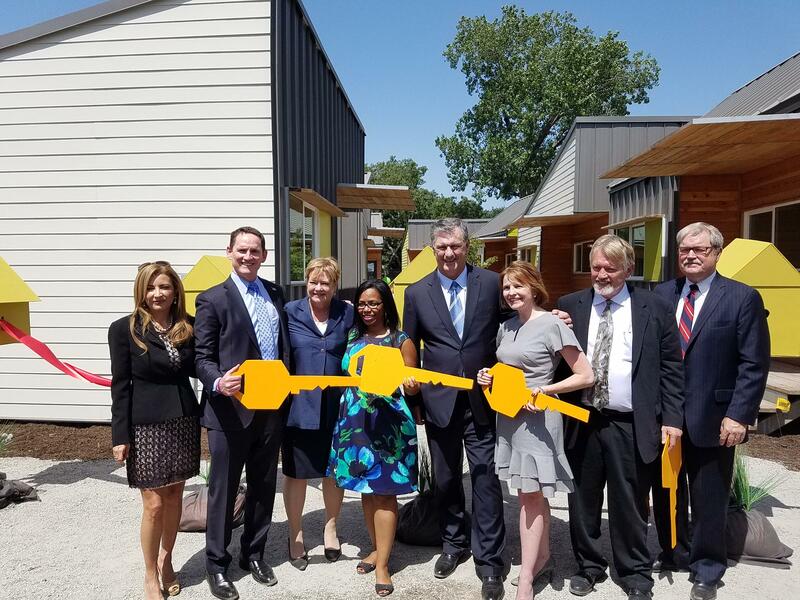 John Greenan is the executive director of Central Dallas Community Development Corporation, one of the nonprofits that helped develop the cottages. He says these houses give the chronic homeless a sense of ownership and control. Each cottage is about 400 square feet and comes with a full kitchen, bathroom and bedroom under a high-vaulted ceiling. Each cottage is about 400 square feet and is fully furnished. It's more than just housing, though: the new residents will get social services and mental and medical health care on site. 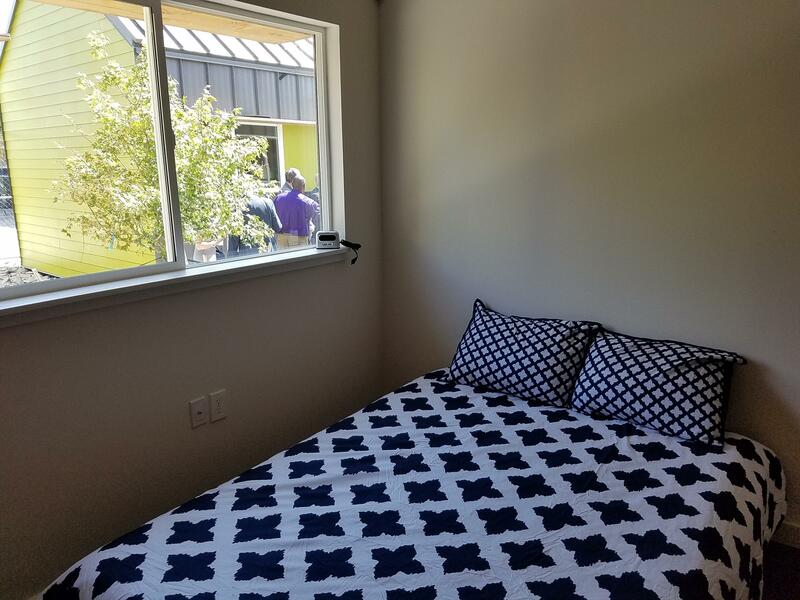 The cottages follow the tenets of a “housing first” strategy, which homeless advocates have touted as the only viable solution to homelessness. By being provided a place to live, the homeless then would be able to address issues like health and employment. Monica Egert Smith is with the W.W. Caruth Jr. Foundation, which contributed millions of dollars to the $6.8 million project. Smith said there’s still a lot of work to be done. Dallas County Judge Clay Jenkins says the Cottages at Hickory Crossing are not the end-all solution to homelessness, but are an effective first step. In addition to these cottages, there are plans to convert large shipping containers into housing. Over the past year, Dallas has seen a spike in homelessness, which prompted the growth of homeless camps, like Tent City under Interstate 45. Some of them have closed following concerns about safety and public health. As Dallas continues to grow and flourish economically, Mayor Mike Rawlings said taking care of homeless people needs to be a priority. From left: Dallas County Commissioner Dr. Elba Garcia, Dallas County Judge Clay Jenkins, Dallas City Council Member Tiffinni Young, Dallas Mayor Mike Rawlings, Monica Egert Smith, John Greenan and Larry James. The cottages are located near the intersection of Interstates 35 and 45, just down the street from where Tent City used to be. Tenants will move into their new homes over the next few weeks. Fifty tiny houses -- dubbed the Cottages at Hickory Crossing -- will soon be home to 50 of the most expensive homeless people in Dallas. Dallas city officials say they’re on track with plans to shut down a homeless encampment known as Tent City. But it may take longer than expected. For the more than 200 homeless people that until recently lived under a highway overpass in Dallas’ "Tent City," the nylon roofs over their heads were a relatively safe haven from the streets, the closest they could come to a permanent home.